Prepared to be dazzled by the bright lights of the slots and casino games at Dazzle Casino. We are packing our sunglasses here at Boku Slots, as we think we may be a while taking you on a tour of this fabulous casino site. Accepts various payment methods including Boku mobile phone bill. Before you are blinded by the dazzling lights of this beautiful looking site, let us tell you about their new player offer. 100% cash match bonus on your 1st deposit – Make your first deposit between £10 and £200, and you’ll enjoy a 100% cash match bonus. To give you an example of what this would mean, if you were to deposit £30 then you would receive an extra £30. When you total this up, it makes an impressive £60 in your account to game with. We were astounded by the selection of games on Dazzle casino, as we are sure you will be too. When you head to the games tab you will see they are categorised as slot games, casino games, jackpot games and scratch cards. There are some old favourites here and some we have never seen before, so let’s dig a little deeper. With almost 250 slot games to choose from, we know you will have a hard time deciding where to spend your 100% cash match bonus. Make sure to try out the fabulous Dazzle Me Slots and if you prefer some featured favourites, then check out the hilarious Bridesmaids Slots. The fun is never ending when you hit the casino games either, with table games like Baccarat Gold and Hi-Lo Blackjack. But take one step further and actually get involved in the dazzling real-time casino games with live Blackjack, Roulette and Baccarat to take part in. This will make you feel like you are on the Las Vegas strip, when in fact you’re at home in your PJ’s with a cup of tea! Now, sometimes you just have a few minutes to spare between work, the kids or whatever. We know that in these moments you are wanting a faster way to win. You have an itch to scratch that just can’t be touched by playing the slots or tables. Fear not our frantic friends, Dazzle Casino have you covered with its selection of scratch card games such as the Germinator or South Park 2. Dazzle Casino offers a selection of games that are also compatible with tablets or mobiles. Just scan the QR code and activate your account from any iPhone, Android or handheld device. Then you can amaze all your friends when you access your account on the go. 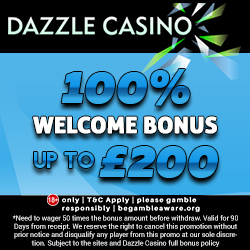 There are lots of weekly bonuses available at Dazzle Casino, once you have worked your way through the new player offers. We have outlined these below, but we should also mention the original bonuses placed into the promotions section with expiry dates; so make sure you check those out too. Monday Madness – As a member of Dazzle Casino you’ll receive an email from them every Monday. Within the email you’ll find offers tailored to your playing style, with extras such as bonus spins or casino cash being given away. Simply choose the codes of the offers you like and away you play! Weekly Surprise – Each Tuesday Dazzle Casino like to surprise their loyal players, with a little something extra. The amount you receive is completely dependnt on how much you’ve deposited and played. So keep an eye on your account and cross those fingers. Game of the Day – If you have deposited within the previous week, then on the Wednesday you will be sent an email which will contain Dazzle Casino’s game of the day. You just need to click on the link, login and you will receive bonus spins to try out the game. It’s the perfect opportunity to try out a new slots game and who knows, you may win some extra funds for your account. Happy Hour – Sunday is usually a day of dread for most people, so Dazzle Casino want to help cheer you up a little. As such they are offering a 12 hour long happy hour, whereby if you deposit into your account between 12 noon and midnight you will receive 20% cash match on any deposit up to £100. That’s put a smile on your face hasn’t it, Sundays just got better. Dazzle Casino has an absolutely fabulous VIP programme, which is available from the moment you register. To start earning those VIP points you just need to wager £16, which will in turn give you 1 point. What do points mean? You got it points mean prizes and so much more with Dazzle Casino. There are various levels of this VIP scheme starting at Bronze and working through to Silver, Gold, Platinum and Diamond. The higher the level the greater the rewards, which could be anything from a birthday bonus to a personalised gift. If you’ve enjoyed your time at the glamorous Dazzle Casino, then why not take a little trip over to their social accounts. Follow them on Facebook, Twitter and even Google+, for the latest updates, tasty titbits and even on occasion’s bonus codes. Because Dazzle Casino want to make sure they keep you happy, there is a committed customer service team to help their players. You can contact them via the online contact form, or you can use their live chat facility between the hours of 6 am and 11 pm. There is also an FAQ section with a large number of questions covering everything from depositing to game errors. Dazzle Casino has made it even easier for you to get started, by adding some of the best payment methods around. You can add funds to your account via credit and debit card, Neteller, Paysafe Card, Skrill, Sofort and even Boku. So if you’re amazed by this glitzy looking site, then we certainly recommend you head over to Dazzle Casino.